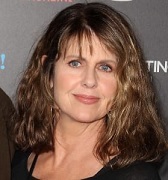 Claim To Fame: Pam Dawber is an American actress best known for her lead television sitcom roles as Mindy McConnell in Mork & Mindy (1978-1982). Family Life: Dawber is married to actor Mark Harmon (March of 1987 - present); together they have two sons, Sean Thomas Harmon (born April 26, 1988) and Ty Christian Harmon (June 25, 1992). Info: Her career began to take off when a friend who was going to New York suggested that Pam accompany her and bring along her modeling portfolio to show various New York modeling agents. Pam had done some modeling in Detroit where she was attending Oakland Community College, and she had also worked as a model and singer in several auto trade shows. One of the top modeling agencies in New York signed Pam to an exclusive contract, and she was soon being seen in magazine advertisements and on TV commercials but Pamela was more interested in acting than in modeling. She began studying voice and acting. Dawber's professional breakthrough came when Gerry Marshall chose her, despite her having relatively little acting experience and not having auditioned for the part, as one of the two title characters of the ABC sitcom Mork & Mindy, which ran from 1978 to 1982. Trivia: When she was modeling in New York, Pam's best friend was Seventeen cover girl Julianne Wasiak, who was also a Wilhemina model. Served as a judge on the panel that chose Christa McAuliffe as NASA's "Teacher in Space". Has a four-octave soprano voice. Assisted husband Mark Harmon in pulling a man from a burning car in 1996. Formed the production company "Pony Productions" with her ex-manager, Mimi Weber. Is a national spokesperson for Big Brothers and Big Sisters of America. Appeared as a Tupperware lady in a Tupperware commercial in the mid 70s for the "Lock in Freshness" campaign. In 2006, hostess of an infomercial for "EyeQ", a program to increase reading speed and comprehension. Her hobbies are canoeing, cooking, horseback riding and swimming. Where Are They Now: During an interview in 2016, Dawber said that she had done it all in Hollywood and once her kids were born she focused on family and raising her children, which would prove difficult with celebrity parents that were always working. The same year, Dawber made a guest appearance on The Odd Couple in a tribute episode to Garry Marshall along with other Marshall alums Ron Howard, Penny Marshall, Cindy Williams, Don Most, Anson Williams, and Marion Ross.